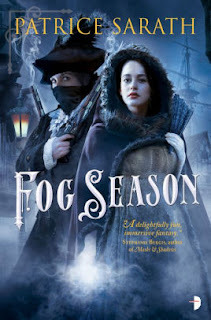 The Page 69 Test: "Fog Season"
On page 69 of Fog Season, elder sister Yvienne Mederos still has things well in hand. She is having a calm conversation with her butler and her cook, and the discussion around the nonfunctioning dumbwaiter is straightforward and unambiguous. What Yvienne doesn’t know, though, is that the decision taken on Page 69 will lead to all hell breaking loose. That’s what I loved about writing Fog Season. The characters have some of the information, but never all of it, and they never know what’s about to hit them. Yvienne tells Albero to bring in the engineers. Poor Yvienne. She’ll soon wish that she let sleeping dumbwaiters lie. “Roasted vegetables with anchovies and wine,” Mrs Francini said with immense satisfaction.